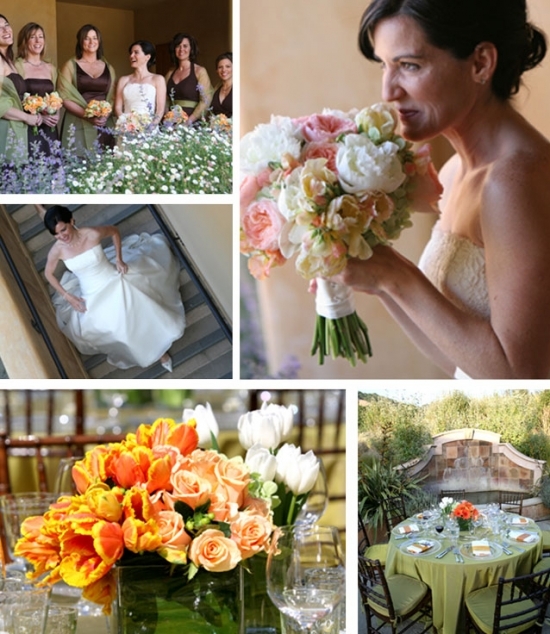 A color palette of tangerine paired with soft greens and walnut brown accents is both fun and flirty. The collateral and color scheme show off the wonderful architecture and natural rustic surroundings of Nicholson Ranch Winery. It is a perfect way to bring the outdoor terrace and courtyard to life without being overpowering. The choice of a topaz linen in lime green is brilliant. The texture brings in a level of sophistication and the subtle iridescence of the fabric looks amazing in the sunlight. The colorful floral arrangements absolutely "pop" - giving you a wonderful contrast. I love how the florist has used what we call the "garden effect" - the utilization of multiple containers, filled with different flowers. This is also great when you intermix these casual designs with a more structured arrangement created from the same flowers. This creates a great cohesive look without being too matchy matchy. I have to mention the cake - its just stunning! The brightly colored stripes are perfectly accented by the petite polka dots and swirl pattern - allowing the cake to make a bold statement, but not relinquishing its feminine feel.